"We are favoring the theory of an accident," Paris public prosecutor Remy Heitz said, adding that 50 people were working on what was expected to be a long and complex investigation. 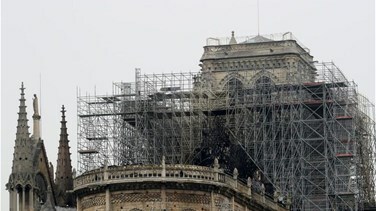 Investigators will not be able to enter the cathedral's blackened nave until experts are satisfied its stone walls withstood the heat and the building is structurally sound. Television images showed firefighters atop the towers. "The fire is fully extinguished," fire service spokesman Gabriel Plus told reporters. "Our job today is to monitor the structure and its movements." "It's a symbol of our country that risked being destroyed," Culture Minister Franck Riester said. Notre-Dame is owned by the state and has been at the center of a years-long row between the nation and the Paris archdiocese over who should bear the brunt of costs for badly needed restoration work. Two of France's wealthiest men, Francois-Henri Pinault, chief executive of the Kering group which owns brands including Gucci and Yves Saint Laurent, and Bernard Arnault, the main shareholder of luxury group LVMH, said they would donate 100 million euros ($113 million) and 200 million euros respectively. The city of Paris pledged 50 million euros.